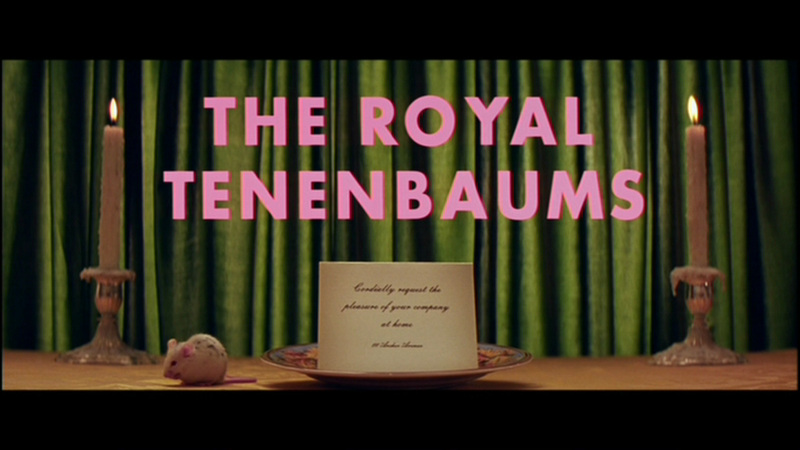 The Royal Tenebaums directed by Wes Anderson and co-written by Owen Wilson follows the lives of three gifted siblings who experience great success in youth, and even greater disappointment and failure after their eccentric father leaves them in their adolescent years. An ironic, sardonic, and absurdist sense of humor pervades the film. 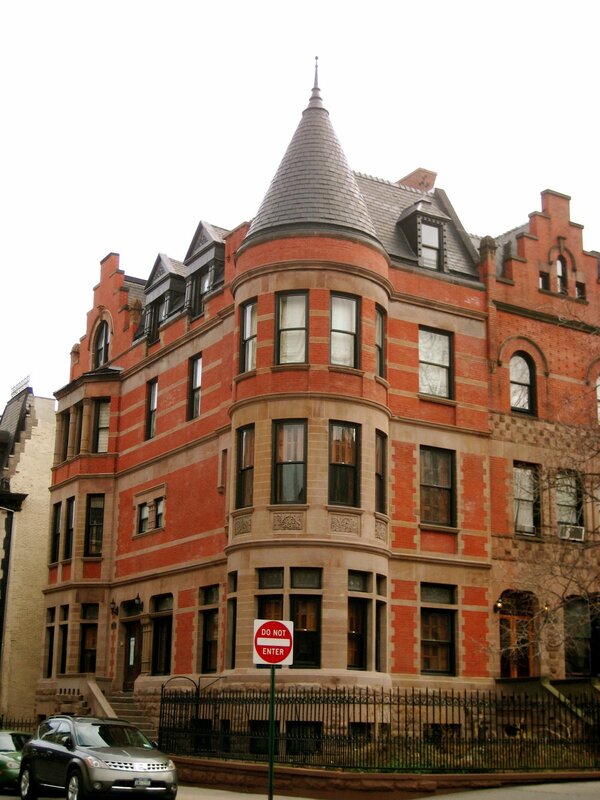 The house used in the film is located near Sugar Hill in the Hamilton Heights section of Harlem in Manhattan, New York City. The address is 336 Convent Avenue. If you want to visit, you can take the A, B, C, or D to the 145th Street stop or the 1 to the 145th Street stop. This is a private residence so do not camp out or re-enact scenes. Wes Anderson explains, “Though we never call it New York in the film, I was looking for a certain feeling of living in New York, not the real New York, more a New York of the imagination”. 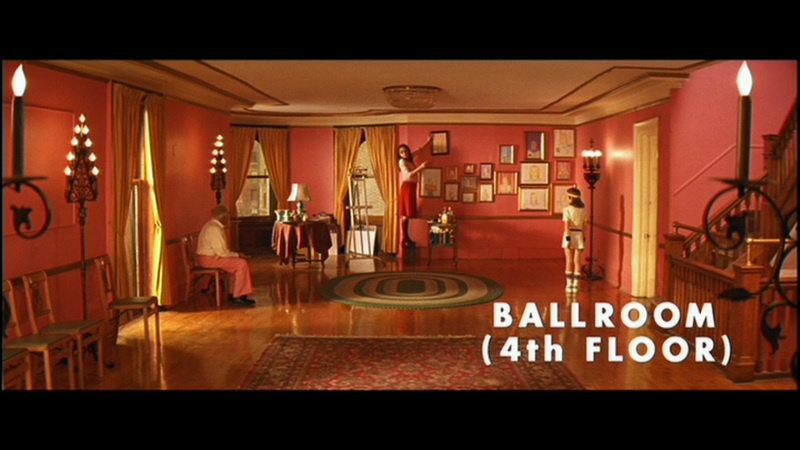 Although the exteriors were largely shot in New York, Wes Anderson intentionally avoided virtually all shots of skyscrapers or other distinctive New York landmarks. The sense of the formalized, fairy tale city is reflected in the screenplay by the faux-New York neighborhoods, unmarked gypsy cabs and various simulated landmarks: Archer Avenue, Mockingbird Heights, Public Archives, the 375th Street, the Irving Island Ferry, 22nd Avenue Express, and Green line Bus (none of which ACTUALLY exist on the isle of Manhattan). Thank you to Mooviees for Production Notes! 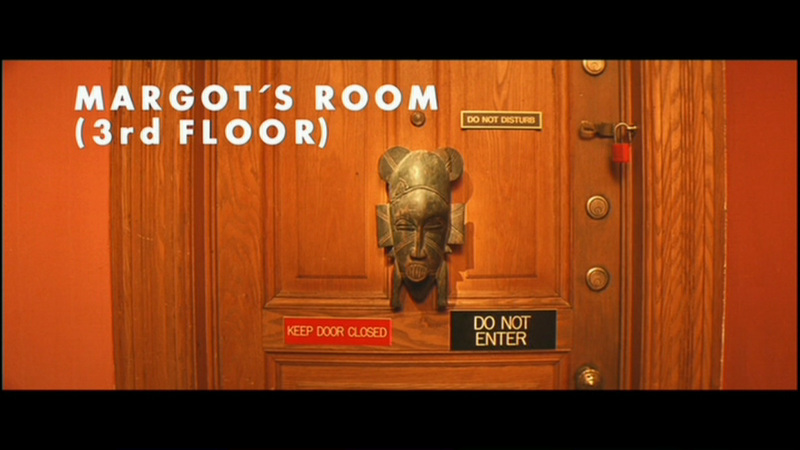 “It was apparent that the house was one of the characters in the movie,” notes production designer David Wasco. The african and tribally inspired room of Margot Tenebabum is filled with mock Baule (Baoule) Masks. The Baule People are from the Ivory Coast of Africa. The mask on the lower left hand side of the above image is a type of Baule mask is known as a Goli mask. It is used in dances during harvest festivals, in processions to honor distinguished visitors, and at the funerals of important figures. The circular face represents the life-giving force of the sun and the horns symbolise the great power of the buffalo. Directly above Margot and to her right is a type of mask known as a Dan mask. These are used for protection and as a conduit for communication in the spirit world. If you want to explore what the other shapes of the masks mean, visit HERE. ALSO, can we talk about that wallpaper? The pattern dates to 1940’s when Chef Gino Circiello decided to open “Gino’s” – an Italian restaurant at 780 Lexington Avenue in New York and he was looking for a decorating theme for his new eatery. According to The New York Times, “Mr. Circiello was a hunter without the means to pay for an African safari, but he reasoned that he could at least afford zebras on his wallpaper.” The restaurant closed in 2010 but will always be remembered for its contributions to the design world – the Franco Scalamandre wallpaper! Eric Anderson, the director’s brother and a gifted artist and illustrator, was another important contributor to the film. 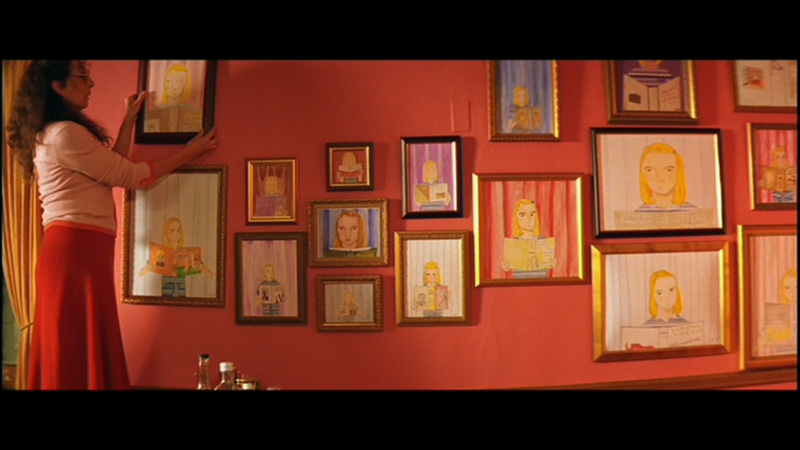 He painted all of Richie’s artwork, including seventeen portraits of Margot, which hang in the family ballroom. Craving Margot Tenebaum look-alike illustrations? Go HERE or HERE or HERE or HERE. Native American Chief Paintings are clearly by George Catlin. Buy some posters HERE. Also, I secretly love the idea of decorating with a full-size medical skeleton. Skulls have been really in lately (as paperweights, and as small repetitive prints), but lets take this a step further and do all 206 bones. 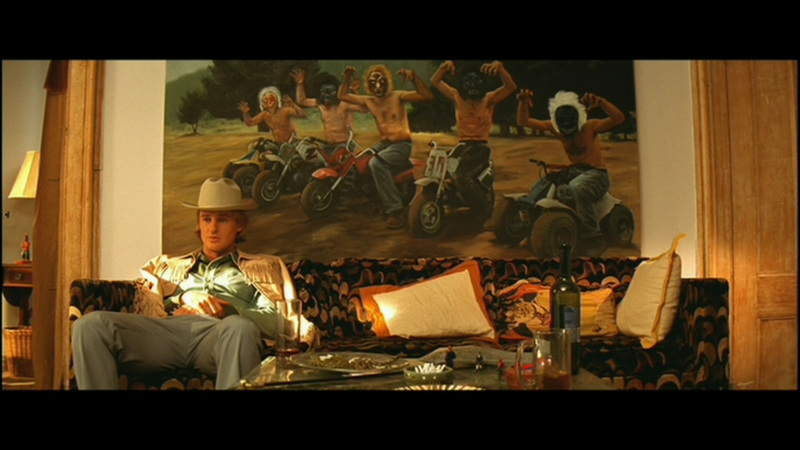 The paintings in Eli’s apartment are by Mexican artist Miguel Calderón. The images were part of the artist’s 1998 exhibit “Aggressively Mediocre/Mentally Challenged/Fantasy Island (circle one)”, though they were not actually painted by him. Calderón took photographs of his friends posed on motorcycles and, after deciding the photographs were not realistic, hired a portrait painter to reproduce them on canvas.I actually have a print in my guest room that has a very similar oeuvre by an artist who also works in the ideals of Hispanic culture and the Chicano movement. 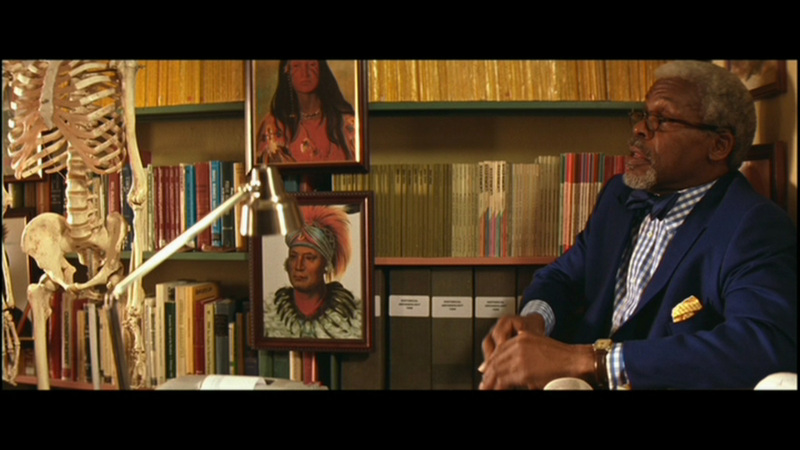 Interesting that each Tenenbaum child seems entrenched in a culture that is not his/her own. 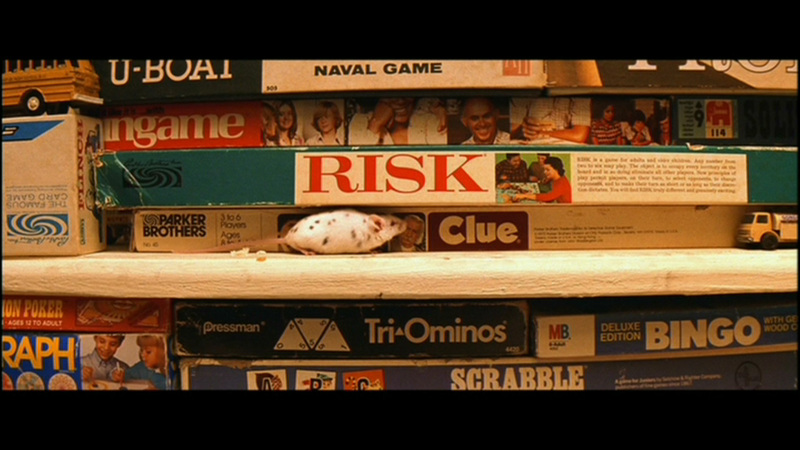 The board game closet, complete with mouse. Vintage magazine, vintage board games, vintage lamps, and delicate teacups. Clearly this burnt red ochre is echoed throughout the film – in the stained glass, in clothing, in the lamplight. Also, a vintage damask couch is ALWAYS a wonderful addition. HOW DO I LIVE IN A QUIRKY FAMILY MANSION? P.S. A big thank you to THIS site for all screen captures of the movie.